This feature length documentary film promotes a powerful, spiritual dialogue on the issue of Christianity and "The Outcast." Addressing the issue in a new and exciting way, the film builds a bridge and offers the Hope and Love of God to everyone. 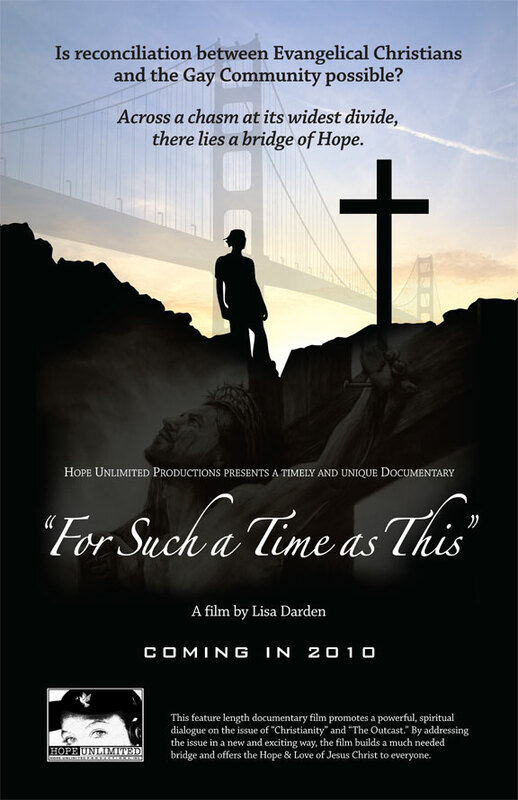 It is “For Such A Time As This” that this film is being made. "I have often wondered it there will ever be room in the pews of Evangelical churches for the communities of the outcast, especially the gay community. Is reconciliation between Evangelical Christians and the Gay community possible? Can common ground be found in the intense culture wars that have consumed our nation? Our documentary film entitled, "For Such A Time As This,"seeks to answer these burning questions. Central to evangelical efforts to reach out to the Gay community are ex-gay ministries that encourage people to pray and help them not be gay. “ For Such A Time As This” explores the issue by interviewing key players from both sides of the growing divide. This film offers a compelling and comprehensive inside-view and illuminates the issue as never before. We aim to turn ignorance into understanding and transform prejudice into promise. It is time to strongly and courageously proclaim God’s Love for everyone including the Gay community. People who have been left outside to spiritually fend for themselves are welcomed home in this powerful and moving documentary that aims to bring about a healing and reconciliation. For Such A Time As This....."making room for the outcast within the heart of Christianity!" People should be shown that the Love of God is available to everyone. Production is underway, with interviews and comments already being contributed by nationally known actors, theologians, ministers, authors and professionals from all walks of life. The film is scheduled for release in 2010. To support this important work and show that God's love includes the LGBT Community, please contact producer/director Lisa Darden at 301-682-7858 or email her here. To preview the soundtrack from "For Such A Time As This," click here! People are talking about the film ... see what they have to say! John and Anne Barbour were married in 1989 and have travelled the world since then. They have recorded 12 CD's of contemporary worship. They also have 5 recordings of their own and have contributed vocals to well over 150 other projects. Rev. Deanna Jaworski, senior pastor of the Church of the Holy SpiritSong in Fort Lauderdale, Florida, shares her gift with these songs from the film's soundtrack. For more information, visit cohss.org.